This release is the latest in the series of “America’s Greatest Hits” which over the years has provided annual collections of the biggest hits of each year in the Billboard pop charts. 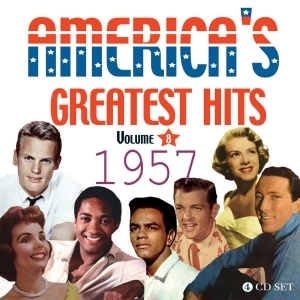 The collection for 1957 is an excellent value 120-track 4-CD set which includes every record that appeared in the Top 10 any version of the Top 10 of the Billboard chart during the year – Best Sellers, Most Played by Disc Jockeys, Most Played on Juke Boxes, and the Honor Roll of Hits. In addition it includes those that appeared only in the Cashbox Top 10, plus the highest performing of those tracks which were listed as B sides which were listed as having reported significant sales which contributed to the A side chart position. Many of the tracks are, inevitably, well-known hits, which went on to score chart success in the UK, but there are more than 30 tracks which did not make it into the UK charts despite their major US success, including classic tracks by well-known artists alongside more obscure hits by artists that never made any kind of impression in the UK. The whole collection is a highly entertaining trawl through the American music scene of the times, a rather different musical experience from listening to our British Hit Parades collections from the UK charts, which naturally feature a high proportion of home-grown talent. As ever. it’s a fascinating and entertaining pot-pourri of pop, as emerging teen idols jostled with R&B acts, new rock ‘n’ roll stars joined the established big names, vocal groups and instrumentals of all kinds had a field day, and the inevitable and collectable quotient of one-hit wonders and novelty hits maintained the variety. It’s an enlightening snapshot of the pop music scene in the USA at a time when the musical landscape was constantly evolving, and it makes for hugely entertaining listening. It is likely to appeal to the many collectors who enjoy these completest anthologies, and will hopefully provide useful programming for the specialist radio programmes which feature pop nostalgia.